Dutch floral paintings and a rich tabletop added to the artsy atmosphere. 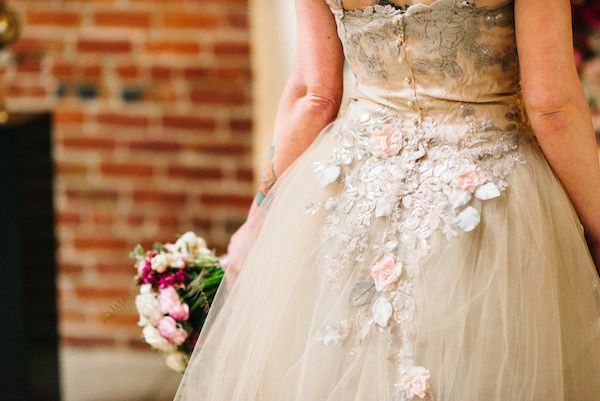 Oh, and can we just talk about this dreamy wedding gown with its floral appliqués on this tulle skirt? Such a pretty dress with its plunging neckline! And nothing could compare to this lovely letterpress stationery from Minted. Something Blue dreamt up the concept and handled the planning, coordination, and even the calligraphy and with florals by Wallflower Design — talk about taking event design to the next level! And lucky for us, Whittaker Portraits was there to capture it all! To this darling sign created by Something Blue! What a fun touch of whimsy! 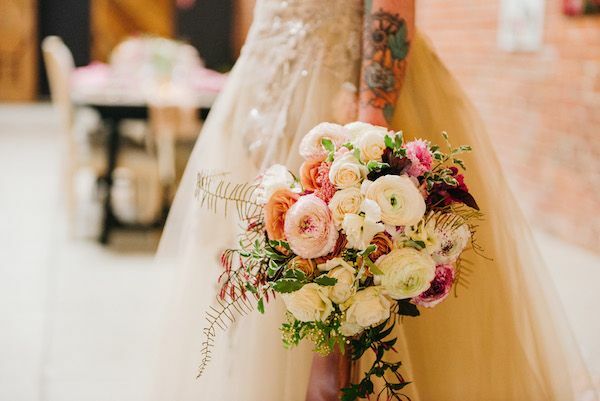 And these dreamy, multi-colored silk bouquet ribbons? And these blooms? Wow! 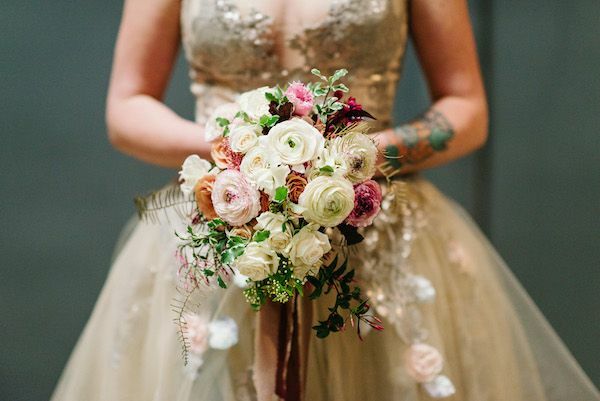 We're seeing spray roses and ranunculus and the prettiest contrast. 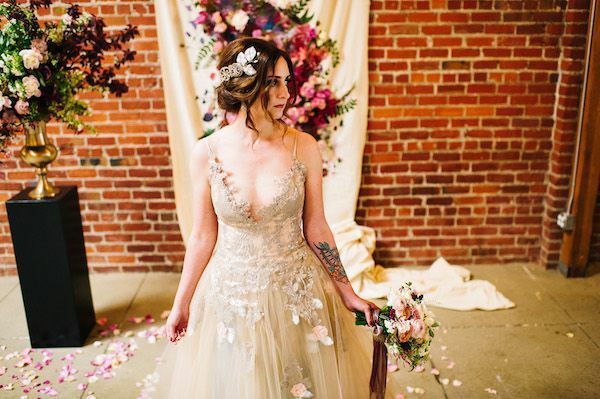 Oh, and what a colorful, and artistic approach we're seeing here with these organic florals and this magical wedding gown from Black Lotus Clothing. Talk about a swoon-fest, you guys! Are we right? Or are we right? 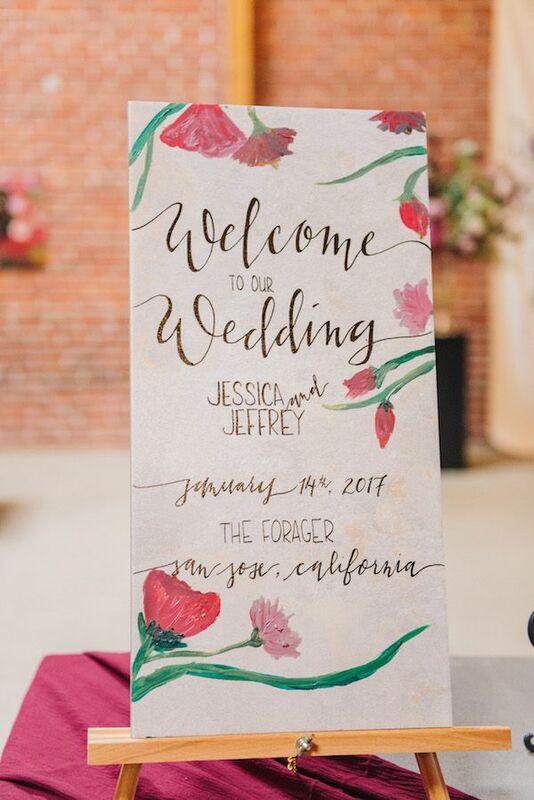 Colorful wedding details, FTW! 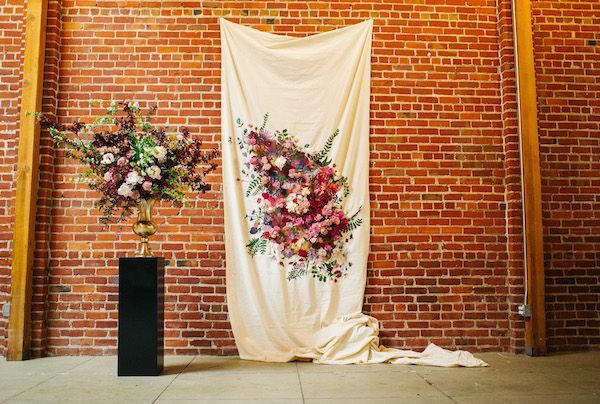 Totally obsessed with this living art piece! 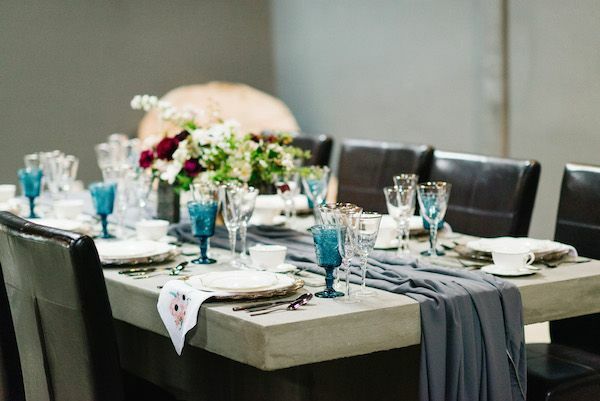 Plus can we just talk about the level of gorgeous we're seeing here with these modern place settings and these textured table linens from Party Crush Studio? A gorgeous engagement ring from Trumpet & Horn really stole the show. And how exquisite was this velvet ring box from The Mrs. Box? 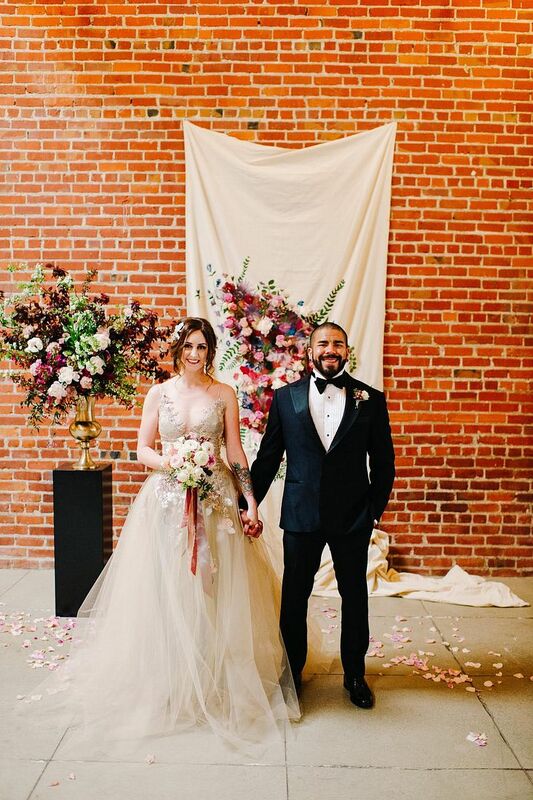 Such a lovely setup and these rentals from Bueprint Studios really helped to set the scene for romance. And how sweet are these two? 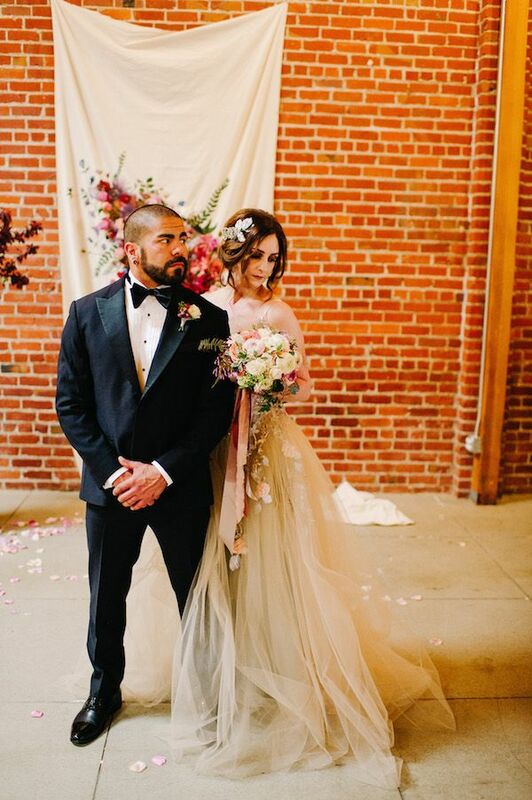 Such a modern, edgy, and vibrant couple these two make! And these three? What a bunch of bridal beauties. 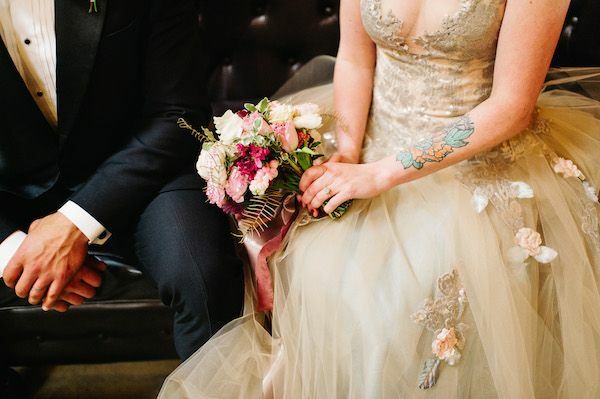 Such a fabulous mix of dress styles and of course we can't go without mentioning these tattooed brides! Concrete and stone details added a cool, edgy vibe and what a compliment these details made to this incredible venue at SJ Forager. Hair and makeup by Hair and Makeup by Katye Rose was absolutely flawless. And then... he kissed her. So absolutely romantic. And what an exquisite and artfully designed setup it was! Talk about a dreamy scene, you guys! Now excuse us because we have some serious pinning to do! Care to join us? 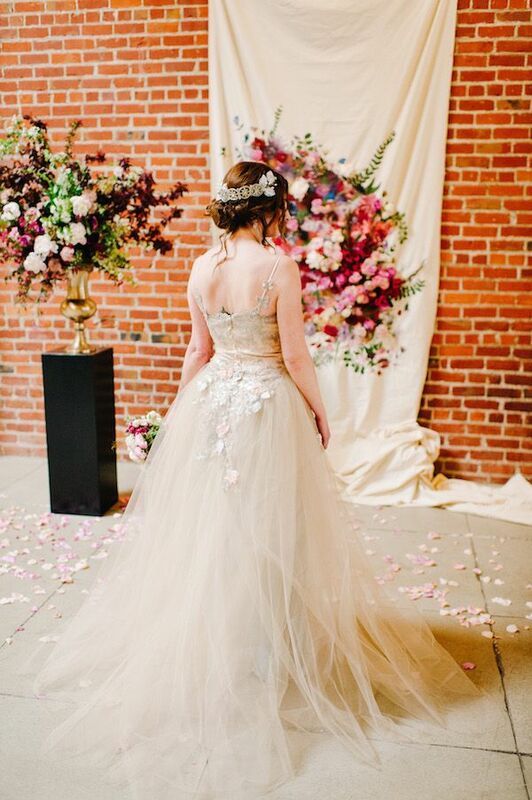 1 One Comment " Artfully Bohemian Wedding Inspiration "